Venus is considered the most hostile planet in the solar system. Along with Earth and Mars, Venus and Mercury make up the inner solar system. Venus is the second planet from the Sun and is the second largest terrestrial planet but millions of years ago, Venus largely resembled Earth due the their similar size and mass. Fact 1. Venus is sometimes called ‘’Earth’s sister planet’’ or ‘’Earth’s twin planet’’ because they are near equal to size, have almost the same mass, are made of the same material and have a lot in common regarding composition. Fact 2. Venus is the third brightest object occurring in the solar system, behind the Sun and Moon. It’s a bright object because of its apparent magnitude of -3.8 to -4.6. This magnitude value makes Venus visible on a bright, clear day. 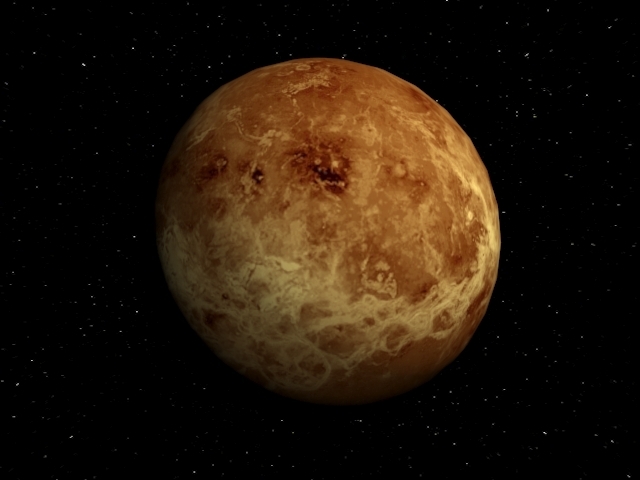 Venus is also the second planet from the Sun, after Mercury. Fact 3. All the planets in the solar system have moons orbiting them, except Venus and Mercury. There are no rings around Venus too. Fact 4. Venus size and mass is similar to that of Earth. It has diameter of 12,104 km. Fact 5. Venus experiences more volcanoes (1600+) than any other planet in the solar system, but scientists are unsure of the level of their activity. Fact 6. Venus is named after the Roman goddess of love and beauty, which makes it the only planet in the solar system named after a female. Fact 7. A day on Venus equals 243 Earth days (to make one complete rotation). This is due Venus’s slow rotation. A year on Venus (revolution around the Sun) takes 224.7 Earth days. One day-night cycle on Venus takes 117 Earth days. Fact 8. At an average temperature of 863 degrees Fahrenheit (462 degrees Celsius), Venus ranks first as the hottest planet in the solar system. Fact 9. Venus’ temperature does vary considerably between day and night because of the sluggish movement of solar winds across its surface. Fact 10. Venus’ surface is considered older than Earth’s surface. Venus’ surface is predicted to be 300 to 400 million years old. Earth, on the other hand, is predicted to be around 100 million years old. Fact 11. Venus’ atmospheric pressure is estimated to be 92 times immense than Earth’s. Essentially, this means that any small-sized asteroid that enters this planet’s atmosphere is destroyed by the strong pressure. This explains why Venus’ surface lacks small surface craters. Fact 12. Close-up images reveal that Venus is always covered by a dense cloud of sulfuric acid. No light can permeate this Acid cloud. This has made it impossible for Astronomers to view the land form and other features via optical telescopes. A lot of data about Venus has been acquired through radar images From the United States and Russia space probes. Fact 13. Because of the characteristic thick atmosphere found on Venus, surface temperature can hit an astonishing 470 degrees Celsius. Fact 14. The surface of Venus is always dry because of the extremely high temperatures there, which can go up to 900 degrees Celsius. This means that if any liquid were to be found on the surface of this planet, it would be instantly evaporated by the high temperatures. Fact 15. Venus’ atmosphere is made up of 96.5% carbon dioxide, and the remaining 13% is hydrogen. Fact 16. Nearly 65% of the surface of Venus is composed of smooth, flat plains. The rest (35%) is composed of mountainous regions. Fact 17. The force of gravity on Planet Earth is slightly stronger than that on Venus, which means if you’re weighing 100 pounds right now, you would weigh about 88 pounds on Venus. Fact 18. The Soviet spaceship Venera 7 was the first spacecraft to land on Planet Venus. This happened on December 15, 1970. Several other spacecraft crashed along the away before this successful landing. Fact 19. Venus’ extremely high surface temperature is attributed to the greenhouse effect. Due to the dense sulphuric acid cloud enveloping it and the carbon dioxide-dense atmosphere, almost all of the radiant heat from the sun is arrested and remains within the surface. Fact 20. The 5 miles high Maat Mons is the largest Volcano on Venus. Fact 21. Venus is the hottest planet in the solar system, with an average surface temperature of about 867 degrees Fahrenheit (464 degrees Celsius). As such, no evidence of life has been ever found on planet Venus. Fact 22. The clouds hanging on the surface of Venus lead to constant acid rains. This is the most corrosive rain than any rain occurring in other planets of the solar system. Fact 23. Scientists think that Venus was once brimming with large bodies of surface water, just like those found on the earth, which, eventually, dried up a million years back when the sun started to give off greater quantities of solar energy. Fact 24. Venus Express spacecraft was able to transmit back data and images, substantiating that lightning occurs on Planet Venus. It also proved that this phenomenon is prevalent on Venus than Earth. This crucial data was relayed in 2001. Fact 26. While Venus is known as ‘’Earth’s sister planet, ’’ its surface characteristics are way different from Earth’s. Astronomers think that the surface of Venus is extremely hot and dry and lacks any liquid water as a result of the scorching surface temperatures. Fact 27. Venus has a constant high-velocity wind that carries along the clouds in a full trip around it each 4 Earth days. Fact 28. Unlike on Earth, there is no sign of magnetic field on Venus. This has led scientists to speculate that the liquid core of Venus is probably a lot smaller than earth’s. Fact 29. Venus, which carries the tag of the brightest planet in the solar system, can become so bright that when the moon doesn’t appear at night, it is able to cast shadows on Earth. Fact 30. Like the Earth, Venus has a reduced lifespan because of its nearness to the sun. The sun constantly swells to become a huge giant ball. Scientists project that in the next 50 years or so, its luminosity will increase to the degree that it would consume Venus and other planets nearby like Mercury and Earth. Fact 31. The first ever observation of Venus from space was way back on December 14, 1962. The U.S. spacecraft (unmanned), known as Mariner 2, passed within 21,000 miles of Venus, travelling via space for almost three and half months. It was actually the first planet in the solar system except Earth, to be viewed from space. Fact 32. Ancient scientists labelled Venus both Hesperus and Phosphorus, wrongly thinking that the object seen in the evenings and mornings were two distinct celestial objects. However, the planet was later renamed Venus after the Roman goddess of beauty and love. Fact 33. Scientists are still unsure whether there is life existing on Venus. But going by the composition of this planet, it’s highly unlikely. No plant or animal species that thrive on Earth could survive in such higher temperature planet, except certain bacteria and viruses. Fact 34. In November 2005, European Space Agency Launched the Venus Express spacecraft to explore Venus. The spacecraft explored Venus until 2012 when the mission ended. Fact 35. Venus spins backwards when compared to other planets in the solar system (also know as a retrograde rotation). As such, sun rises in the west and sets in the east.